Industrial production surprised again, but after a sequence of positive surprises, November data came in as a huge disappointment. Industrial production dropped by 2.1% compared to the previous month, translating into an only 3.4% year-on-year growth. This is a significant slowdown and well below the year-to-date average growth of 5.2% YoY. The Hungarian Central Statistical Office (HCSO) hasn’t shared any detailed data, but in its commentary, it emphasised two sectors. The automotive industry held back the industrial production numbers on the base effect stemming from last year. Meanwhile, the output in the food industry was cut by the severe bird-flu epidemic. Against this backdrop, it is fair to say the disappointing performance is due to temporary factors. 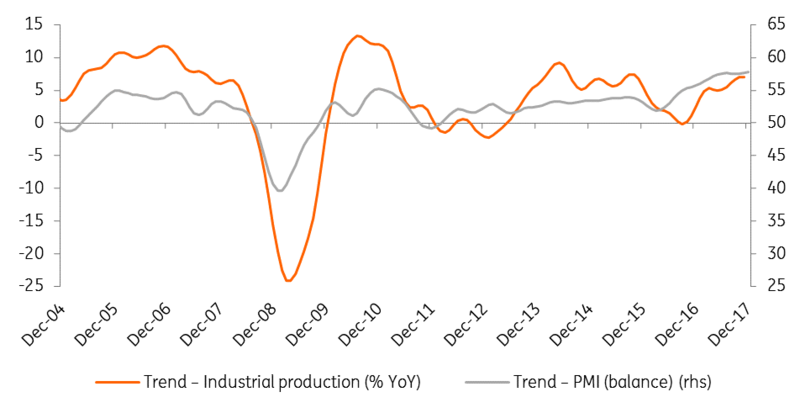 Taking this into consideration the recent developments in the manufacturing PMI and other ‘soft’ business indicators, we see the industry to shake this slowdown quickly, reaching an above - 5% YoY growth in 2017 as a whole. When it comes to the overall economic activity in 4Q17, the disappointing industrial production reading is quite discouraging, but the October performance and the upside surprise in the retail sector are taking the edge off. However, the chance for Hungary to reach an above - 4% YoY GDP growth in 2017 as a whole has just decreased.